• Running Pandora and other applications in the background – The iPhone has the ability to stream radio stations such as Pandora and slacker whenever it comes under the vicinity of any 3G or Wi-Fi connection. But the sad part about this feature is that the streaming stops as soon as the user starts playing games or even checks his/her email. The only solution that can be offered is for users who have jailbroken iPod touch or iPhone. 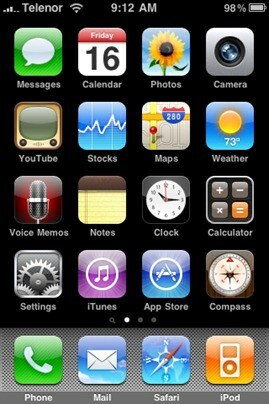 One can download the multitasking application called iPhone backgrounder and use it to use multiple applications. •	Operating IMAP Gmail – If you have been using the iPhone, and if you use the Internet on it, then you must be familiar with the Gmail application. But the Gmail application on the iPhone doesn’t totally support all the features of gmail. Threaded viewing is not at all possible in the iPhone. So if you are one of those who send an email to a dozen of people and expect reply in threads then this application is not for you. Gmail’s web app. can be a good replacement for the default application as it solves the problem. •	Creating Contact List Groups – Isn’t this feature there in almost every phone, but the revolutionary iPhone 3G 3.1.2 lacks this feature. One cannot create contact groups, and classify contacts into groups. The iPhone lists all your contacts in one single group. Apple won’t be fixing the problem anytime soon, so if you want to solve this common iPhone problem, then you can download this application called AB contacts which helps you to classify contacts in name, age, groups etc. •	Hide Default Applications – The default applications present in the iPhone 3.1.2 cannot be removed as well as cannot be easily hidden. Most people do not use these applications and they just keep lying cluttering your phone. These default applications can neither be hidden nor customized, so even if you aren’t using them you have keep them in your iPhone. Apple doesn’t offer any solution for this, but iPhone jail breakers do and you can take your phone’s default applications to the trash bin. These are some of the most common problems that are there with the iPhone 3G, but these problems are with the software and not with hardware. Software problems can always be solved, by a little exploration of the operating system. So yes the iPhone 3G 3.1.2 is a good phone.